Comprehensive practitioner credentialing is more important today than ever before. It’s estimated that at least 5% of all physicians in this country have significant quality, behavioral, or substance abuse issues that adversely affect patient care; and negligent credentialing claims against healthcare organizations are on the rise. The demand today for qualified, appropriately trained credentialing and medical services management professionals far exceeds the current supply. 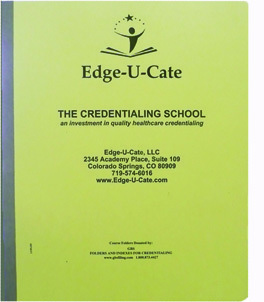 Edge-U-Cate created The Credentialing School to provide the training necessary to meet today’s demands for qualified personnel in this critical role. Class sizes are limited, so early registration is encouraged!